I have always been a big fan of space from as young as I can remember. My sister taught me the basic constellations. I learned all the planets and their specs from book after book. I was even lucky enough to take astronomy in high school inside the school's planetarium! A few nights ago we were sitting outside watching the sunset just as the brightest stars were appearing in the sky. A friend and I were figuring out which they were, Canis, Jupiter, what's that one? A new one appeared, too bright to be a plane but moving to fast to be star. I whipped out my iPhone, launched SkyView and figured out it was the International Space Station! I hadn't seen it before since it's only in the sky a maximum of seven minutes at a time and this was a real treat. How amazing would it be to be one of a handful of humans to circle the planet? In this video, Commander of the International Space Station, Sunita Williams gives a great tour of the orbiting vehicle. It's about 25 minutes long but worth the watch. 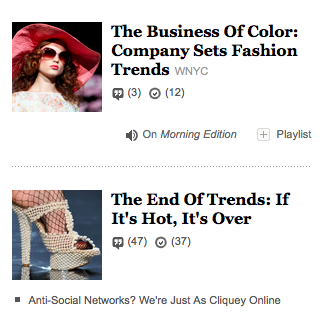 Between yesterday and today NPR completely shifted its take on trends and trend forecasting. Yesterday Linton Weeks wrote an interesting article about trends and how the idea of trends has really only come to light over the last 50 years, and in that time period we've seen trends come and go. Fashion changes and as products become trendy they fall out of populous favor. The article's final conclusion is that once a product hits trend status, it's over. Ubiquity decreases allure. Then, today, Ilya Marritz wrote a piece about the Pantone color system and how the company sets the trend forecast for the color palette of new products. They hire designers and whisk them away to a secretive white room in Europe to develop and influence the color trends for the next year. The article ends with this gem, "But if designers disregard the trend, they risk irrelevance — just about the worst thing imaginable for any label." Disregard and become insignificant. Article 1: If you're trendy people will ignore you. Article 2: If you're not trendy people will ignore you. Great! Thanks for clearing that up NPR. Well done. I'm going to stick with what I love. It's not what you wear, it's how you wear it. Own your style and people will follow, trendy or not. Good has a great infographic on the amazing state of American goods. 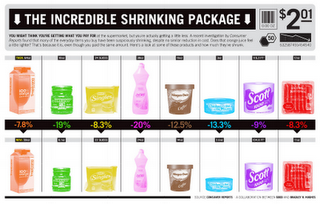 If you're paying the same price for a product as you were last year, odds are the product itself has gotten smaller. Thanks big business! I'd love to pay the same money for less reward while still earning the same amount of money. Isn't this partly why Egyptians are rioting? Copyright infringement is a serious issue that small designers often don't have the resources to fight. Jezebel.com has a shocking, but not surprising article on about how the clothing chain Forever 21 doesn't develop their own fashions they just rip off the small, creative designers. Beware artistic friends! This kind of thing is happening in fashion, art and design. Get informed and choose where you shop carefully. I've been in love with creating my own time lapse videos of life and I really love this video of the December 2010 Blizzard in New Jersey. Life by the beach in California doesn't provide weather like this. NOT THAT I MIND.